Club Penguin Cheats by Mimo777 Club Penguin Cheats by Mimo777: Club Penguin Cave Expedition Reviewed By You! "WOW! The mine and the new caves ROCK! I especially like the cave full of treasure, with the glittering pool of water. And then it leads to an AMAZING watery kingdom. Its the perfect place for divers, mermaids and merpenguins, cave penguins or I've even spotted a few pirates looking for treasure! Its great fun for everyone!" Now, Club Penguin want to know what coming event we are the most excited about. Is it the Puffle Party, the play at the Stage, one of the catalogs or something else? I would love to hear what you are looking forward to, too! Check out this sweet new avatar creator! I love it! IM AM SO PUMPED FOR THE PUFFLE PARTY!!!! I HAVE TONS OF PUFFLE STUFF IN MY IGLOO GETTING READY FOR IT!!!! WE'RE FINALLY GOING TO TIP THE ICEBERG AND GET THE SPECIAL CATALOG! lolz. wacky idea, but it may come true. I'm a non-member so I really want to see the catalog. I hear it's special items that even NON-MEMBERS can buy. I'd loooove that! Mermaids? there only in fairy tales and what so ever. I'd like the I HEART MY PUFFLE T shirt to be back too!!! i like the puffle party and cant wait! im waiting for the puffle party. Lets hope that the orange and the brown puffle are released in the party!! Wooo!! I want that Puffle partay!!!!! Alright, but there is no secret catalog. In fact, the Iceberg cant tip. Its a proven fact. Anything you see on youtube or something is fake. But, its still fun to try! I know right? I really hope that this years puffle party will be better than the last one! WOOT. And a new puffle would make it better! me two! and i might be able to get more!!! i am jumping out of my seat in excitement! hey i love the "I heart puffle" t-shirt, on my first account the first thing i bought was that!!!!! 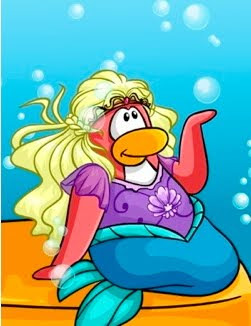 my penguin dresses like the one in the picture all the time! IM SO PSYCED FOR THE PUFFLE PARTY AND EVERY THING THATS COMING UP ON CP!!!!! ROCK ON CP!!!!!! I'm ready for the Puffle Party! It's not my favorite, but it focuses on the puffles, not the penguins, which is cool. I think I am mostly excited about the party ( of course ) and the new play is second! I think there is something missing... Oh I know the clothes catalog! In the newspaper it does't say when it coems out! Usually it comes out the first friday of the month! It is Febuary right? By the way pretty I hope that happens too! Because I am a member but I also have a non member penguin I just created. I need something for that penguin. By the way again I don't think that may happen because you know how cp is. They can't even let non members buy those World flag pins! That isn't fair!!!!! That seems so cool! I hope that happens too. I remember for one April fools day they turned us into Green puffles. That was awesome. Hmmm, yeah i have no idea where the new mission is. Its a good question i think were all wondering. Try sending Club Penguin an email. If you find something out, Mimo ma give you credit! I WANT NEW PUFFLES!!!!!!!! HOT PINK ONES! BROWN! ORANGE! GOLD! AQUA! MONKEY PUKE GREEN ( dont ask )! oh and also i like the picture of the mermaid.my cat is sick... :( lol that was random! want to have a Super Bowl party? That woulb be awsome!Even though I'm a member I bet there are still awsome things in the catalog.Don't keep your hopes down you never know till you try! I don't know! Nobody know actually, except for Billybob of course! Cool! So am I. Next time don't use caps and not so many exclamation points! Cool! Mermaids are so... mystical. I am rooting for the Colts too! We should have a Sooper Bowl party! We turned into puffles? (hop hop hop) Uh oh! I'm randomly fluffy. Um, that is just a rumor that you get a catalog, I know what you're talking about. It's not true!...But good luck with tipping the ice berg! Oh my gorillas I want that shirt SO BAD! Oh my golly-gee willikers! (...?) Sorry, absolutely nothing to do with your comment but I think that I saw you on CP yesterday at the Town! Server Sherbet I think. My penguin name was Hnwjanuary11 and I was with Mrbubbles510, my friend from school. Were you it? Just wondering! *Shivers* Freaky. Hey can I get some credit because I thougt of the leaf pin and puffle party letters, but I couldn't go on until I got out of school. Does anyone know what the mean by 'blue' furniture coming out? Maybe a huge water bowl for a monsterous zebra? I couldn't tell you about the letters because I froget to go on and my favorite shows were on tonight so sorry. Hmmmm, I think your right! Maybe Club Penguin hasent had the time to make one beacuse they are so busy working on the Puffle Party. But dont worry, it will come out. We can trust Club Penguin. Right? Just Kindding. They'll get it out. Awesome! Keep it up! Decorating igloos for parties is one of my favorite things to do to get ready for upcoming events on CP. This new Puffle Party coming up sounds like a BLAST! Just thought I'd let you know that in the Feb catalog there are some new backgrounds. If you click on the 1st puffle one it says would you like to buy "undefined for undefined"... and the "cutout" background says that "this item is unavailable". Yes, I agree! It'll be really cool. Last time, as well as I can remember, there were different colors of puffles at the Snow Forts. There was the pink puffle at the iceberg, black in the cave, and i can't really remember any other places.... But I'm really excited for the upcoming Puffle Party! Yes, i really hope they get a brown puffle, that would ROCK! And, i have no doubt, the brown puffle would be introduced at a puffle event if ever a brown puffle is introduced! There is a new start up screen that says members look out for new puffle furniture. It shows pictures of the new puffle furniture!!!!!! Well Well Well, nice guess, it was right. But lots of other people probably guessed that too so Mimo cant give you credit. Maybe next time! hey mimo, remember last years puffle party? A new puffle came! Hint ,hint. duh! A new puffle might come, maybe brown, or orange? Im ready too, I agree that the puffle party isnt the best, its hard to live up to parties like:Medieval party, The Christmas party , and The Music Jam. So you kinda have to think about that too. I'm definitely lookin forward to the new stage and the puffle party! Just Commenting... The Mermaid Looks Like It Is Sitting On A Penguins Foot/Flipper.! Well Pudding And Bye!